As a recreational writer myself, one of the things I have been most excited about doing as a librarian is facilitating a creative group. 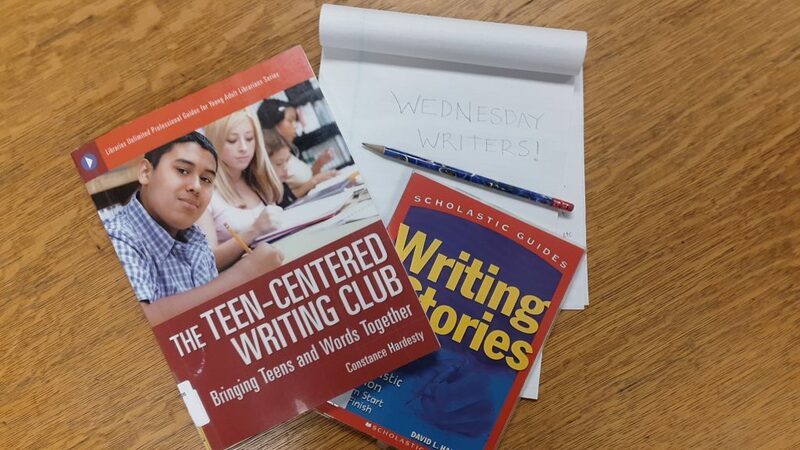 I am pleased to announce that LPL’s youth creative writing program, Wednesday Writers, will have its first meeting on Wednesday, April 10th, at 4 pm in the Youth Area. My goal with this group is to foster youth patrons’ creativity and interest in writing while building skills in writing, story-telling, and critique. There is no grading, no judgement, and no requirements – participants can write about whatever they want, whether that be short stories, novels, poems, songs, fiction, non-fiction, fantasy, sci-fi – the sky is the limit. With Wednesday Writers, I want to provide a space for young people who are interested in writing to explore that interest, have fun, and write freely. Each meeting will begin with a warm-up free-write, where I will provide participants with a short prompt to get them in the creative mindset – for example, “write a 10-word story about a road trip,” or “you found a letter laying in the street – what does it say?”. The bulk of each meeting will consist of workshopping, where each writer will get a chance to share of piece of writing with the group and receive constructive feedback about what the readers liked about the piece, what they thought could be changed, or what made them curious. We will also discuss different writing styles, genres, and story elements to build participants’ skill sets. Finally, I will offer a more long-form prompt for them to write about on their own and bring to be workshopped at the next meeting. If you are interested in or curious about writing, or you just want to try something new, I highly encourage you to take part in this program. It is free and no sign-ups are required. Just bring your creativity and enthusiasm and we will have a ton of fun. Dates for the spring are Wednesday, April 10, April 24, May 8, and May 22 from 4-5 pm. Dates for summer will be announced in the near future.